Why is No One Ever Depicted Smiling on Icons? 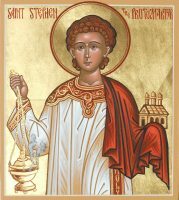 I have never seen a saint depicted on an icon smiling. Did they really not smile? Is smiling a sin? Question: I have never seen a saint depicted on an icon smiling. Did they really not smile? Is smiling a sin? – Julia. 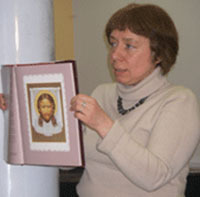 Answer from Irina Yazykova, art historian, Chair of Christian Culture at St. Andrew’s Biblical Theological Institute and instructor at the Kolomna Theological Seminary. Dear Julia, it goes without saying that smiling is not a sin. But smiling is a natural emotion – one might say an earthly one. It may even be the nicest thing on earth, especially if it is the pure smile of a child, the kindly smile of a mother, or the sincere smile of a friend. But the icon speaks to us of something above nature; it is an image of another, transfigured reality; it is an image of the Heavenly Kingdom. The icon is not a portrait; it is the transfigured and ideal image of man. Therefore, there is no place here for psychologism, vivid facial expression, or the depiction of any affects. In iconographic terminology, the face is called the countenance [Russian: lik, reflecting the sense of the Greek prosopon –Tr. ], inasmuch as it does not show man’s natural condition, but rather his transfigured nature. Therefore, the countenance on the icon should be like the clear surface of water, in which the countenance of Christ is reflected. The Apostle Paul writes the following about the goal of Christian life: My little children, of whom I travail in birth again until Christ be formed in you (Galatians 4:19). The Savior said: he that hath seen Me hath seen the Father (John 14:9), for which reason the saint on an icon is a representation not only of himself – but through him, and with him, we stand before Christ. 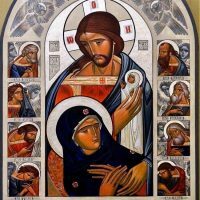 In a word, the meaning and content of the icon is very far removed from what would be permissible in portraits, whether they be realistic, avant-garde, or of any other kind. Of course, this does not mean that all emotion should be banished from the icon. Emotion is expressed in iconography through gesture: the joyful, blessing gesture of the Archangel Gabriel in the icon of the Annunciation; the prayerful lifting up of the hands towards heaven in the image of the Theotokos Orans; or the hand pressed to the cheek as an expression of suffering, as the Theotokos is depicted at the Cross, etc. But take note that the countenance remains dispassionate, calm, and clear. Somewhat more emotional images are permissible in the panels of an icon depicting the earthly life of a saint, but then only in a restrained manner. The eyes are of crucial significance in the icon. In ancient icons they were depicted large, as if wide open. The well-known expression that “the eyes are the windows to the soul” applies nowhere better than to the icon. The eyes also contain the image’s emotional key. Compare several different icons of the Savior, and you will find that on one He is merciful, on another severe, on the third attentive, on the fourth detached, and so on. The accent on the eyes creates the effect that it is not you that is looking at the icon, but the icon that is looking at you, as it were. But this is not a matter of emotion, but rather of expression. 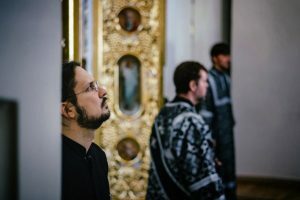 It is no accident that Archimandrite Zinon, the outstanding contemporary iconographer, says that on icons one needs to depict not the eyes, but rather the expression. Finally, light provides emotional intensity in iconography. Therefore, Theophan the Greek’s frescoes and icons are described as dramatic and full of energy, because they have very intense light, as if bursting out from within. In contrast, Andrei Rublev’s icons are characterized as quiet, clear, calm, and contemplative, because they have no light effects, lightning flashes, or energy flares; instead, the light pours equally over the surface of the icons, gently falling on the hills and woven garments, with the countenances illuminated by an inner light. At the same time, it should be remarked that both masters depicted the expression of countenances without any external emotion. You will not find smiling countenances in the classical iconography of either Byzantium of Rus’, because these are the countenances of those to whom we turn in prayer. Even secondary figures were depicted with almost no active emotions, although less stringent requirements were in place with them. To summarize: No one smiles on icons not because smiling is a sin or because the Heavenly Kingdom is a sad place, but rather because the icon is a revelation not only about God, but also about man; the human nature of the saints reveals a much greater depth than we are accustomed to perceiving in our everyday world.